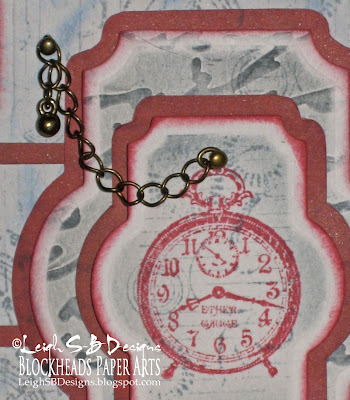 Velvet Paw Creations: A Grungy "Pocket Watch" Tag Card! 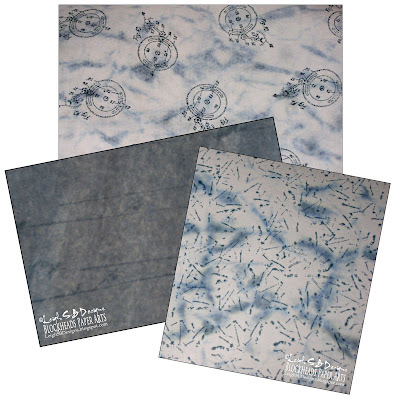 Last week I showed you how to create three Grungy Backgrounds using the Grunge It Up stamp set exclusive to Blockheads Paper Arts and also shared a Father's Day card I made using 2 of those backgrounds. Today I'm back with another project using the top grungy background in the pic below and images from the Victorian Inventions set too. Grungy Father's Day Card using the middle and bottom backgrounds in the pic above. Click on the photos to see the full tutorials. Weathered Wood Distress Ink, Rhubarb Stalk Memento Ink pad, Tim Holtz Idea-ology Paper Stash cardstock - Retro Grunge, Tim's Foam Ink Applicator tool, white cardstock, Penny Farthing charm, Tim's Idea-ology Charm Clip, Tim's Idea-ology Hole Reinforcers, Spellbinders Labels 21 dies and Tan Embossing Mat, Cuttlebug Script Embossing Folder, tiny antique gold brads, permanent adhesive tape, craft glue, pop dots, tiny and standard hole punches, wooden bead dangles, assorted fibers and ribbons. 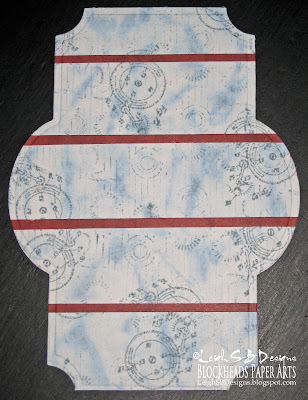 See the Grungy Backgrounds post for my tutorial on how to create Grunge Background #1 - Gears then cut the background into strips. 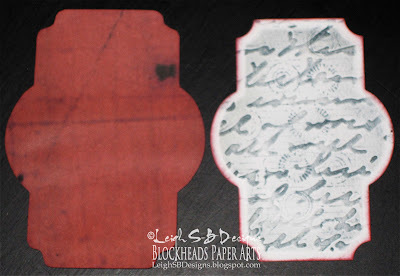 Stamp the grunge image (top left on the stamp sheet) with Weathered Wood Distress ink on each strip, but before stamping onto the strips first remove some of the ink by stamping first on a scrap piece of paper and then onto the strips for a faded effect. Run the strips through a Xyron to add adhesive. Adhere the strips to a sheet of Tim's Retro Grunge cardstock, I chose the one that has the redwood pattern on one side and radiating stripes on the other. Die cut out the main panel for the tag with the largest Spellbinders Labels 21 die and emboss it with the Spellbinders tan mat. Emboss a sheet of textured white cardstock with the Cuttlebug Script embossing folder and die cut out a panel from a smaller Labels 21 die then emboss with the tan mat. Use the metal die as a stencil and apply Weathered Wood Distress Ink to the embossed designed and around the edges to create a frame. Apply Rhubarb Stalk Memento ink to the edges of the die cut. 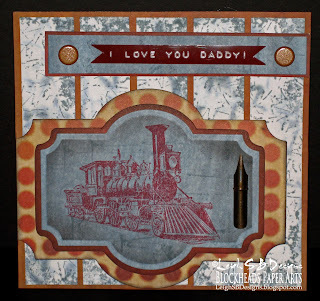 Trace the outline of the same metal die onto a piece of Tim's Retro Grunge cardstock with a pencil and cut out a mat for the panel with scissors. Die cut out a panel from the second to smallest Labels 21 die from textured white cardstock and emboss with the tan mat. 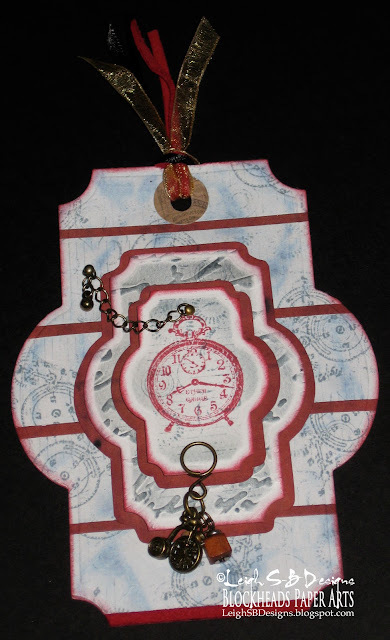 Use the metal die as a stencil and apply Weathered Wood Distress Ink around the edges to create a frame. Keep the die in place and stamp the same Grunge image used on the large panel onto the small panel with Weathered Wood. Stamp it twice vertically to fill the panel and also press the inked stamp onto scrap paper to remove some ink before stamping it onto the panel for that grungy faded look. 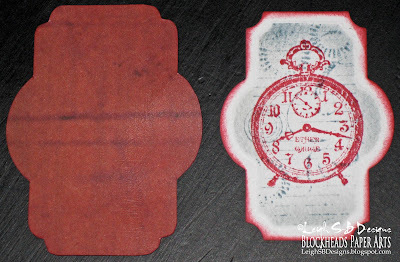 Stamp the clock image onto the panel with Rhubarb Stalk Memento ink and apply the same ink to the edges of the die cut. Trace the outline of the same metal die onto a piece of Tim's Retro Grunge cardstock with a pencil and cut out a mat with scissors. 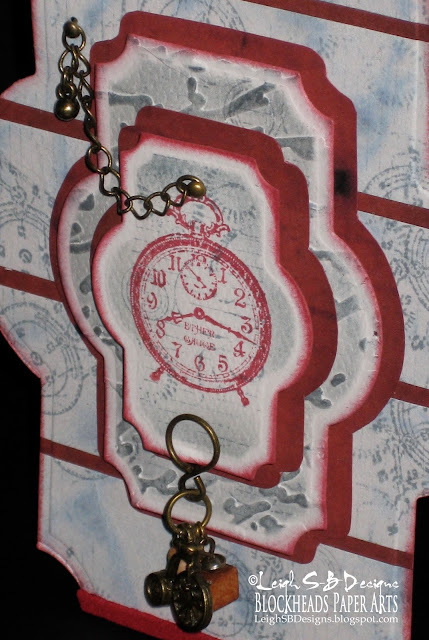 Punch a tiny hole at the top of the clock image and attach a length of antique gold chain to the panel with a tiny antique gold brad so that it now looks like a pocket watch. Mount the clock panel to the mat with pop dots. Then adhere them to the embossed script panel with glue. Mount the script panel to its mat with pop dots and then adhere everything to the large panel with glue. Punch a tiny hole into the large panel and attach the other end of the chain to it with a tiny brad. Hang a ball charm on the end. 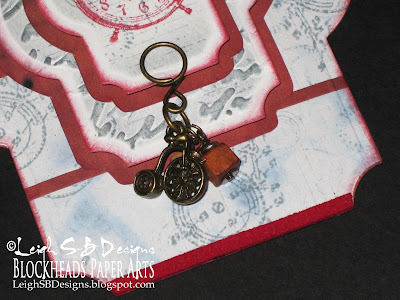 Attach assorted wooden bead dangles and a penny farthing charm to one of Tim's Idea-ology charm clips and attach the charm clip to the clock panel. Punch a hole at the top of the large panel and add one of Tim's Idea-ology hole Reinforcers to the hole. 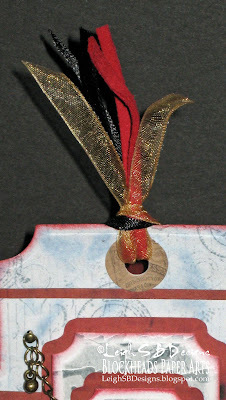 Add red suede cord, gold-brown and black ribbons. Also adhere a strip of the red suede cord to the bottom edge of the tag, you can see that in the pic showing the charm above. 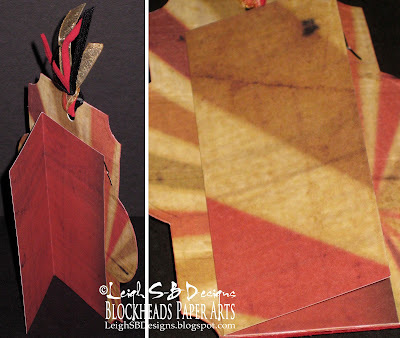 Make a small folded card from a piece of Tim's Retro Grunge cardstock to fit the back of the tag. Cut the bottom edge of the back flap at a slight angle so that the tag card leans slightly backwards like an easel and you're done. Now how about some challenges! Thanks for visiting with me! Don't forget to keep an eye on the inlinkz section below where you will start to see a collection of Grunge projects by my fellow Blockheads team mates. Ciao for now and Happy Stamping! 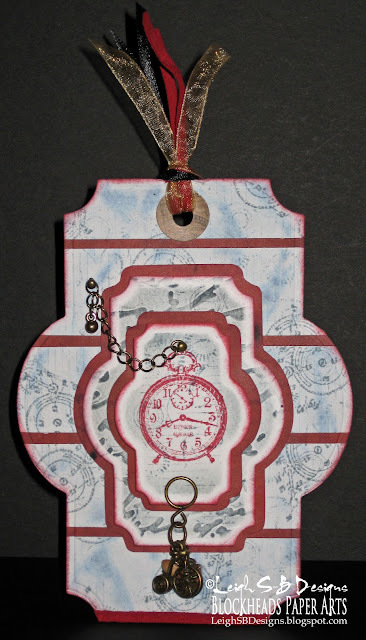 Love this pocket watch grungy card!